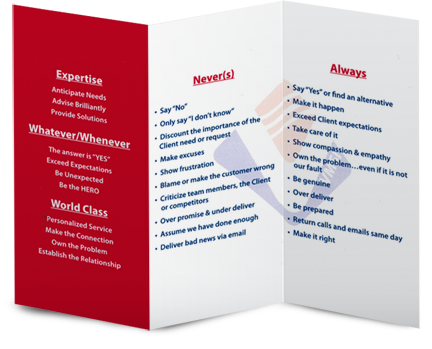 CUSTOMER experience | Veterans Management Services, Inc.
Our mission statement: “To Be the Best Decision our Clients make” – simply put; drives everything we do! Our #1 goal is to do anything and everything required to ensure absolute 100% customer satisfaction—100% of the time. VMSI offers our customers a unique experience, one in which all the benefits of working with a small business are experienced and all the resources of a large business are delivered. Our customers have immediate access: 24 hours/day, 7 days/week, 365 days/year to all levels of VMSI management up to and including our CEO. VMSI has purposely created a relatively flat and employee empowered management structure to eliminate all the typical layers of bureaucracy that often hinder an organization’s ability to make rapid decisions to solve customer problems. We don’t attempt to be every answer for every customer. VMSI has grown into, specialized in and has focused on a core set of service offerings that solve our customers’ challenges and we hire industry leading experts to deliver industry leading—innovative solutions focused on measurable results. Because VMSI only pursues select opportunities within our areas of expertise and only teams with proven teammates, we are able to assure the best overall solution for our customer’s mission with lock-step approaches to service delivery and ultimately an unwavering customer focus by our employees and teammates. Our customers and past performance references say it all. We believe in investing for and delivering on the projects we have today rather than worrying about the projects we might win tomorrow. VMSI has excellent past performance on every contract we have performed and has never had an option not exercised on any contract. We are able to deliver all the benefits and resources of a large company without the inefficiencies of layers of bureaucracy hindering the ability to provide rapid responses for innovative solutions. VMSI has invested in the infrastructure, program management, cloud-based technology, recruiting, processes and procedures to effectively deliver on 100% of our projects 100% of the time ensuring 100% customer satisfaction. Not only are we able to provide all the resources of a large company, we are able to deliver all the benefits often associated with small companies such as flexibility, agility, rapid response, lean management structure, cost savings, familiar customer relationships and immediate access to all executive management. Through 100% cloud based technology, an unmatched recruiting capability and regular onsite customer visits anywhere in the United States; VMSI has been able to provide support services in nearly 40 locations across more than 20 states. We are able to rapidly recruit and effectively manage customer engagements anywhere in the United States as if we were headquartered next door. Because 100% customer satisfaction is our driving outcome, VMSI has created a scalable corporate Program Management Office (PMO) capable of delivering within scope, on time and within budget. Through continuous PMO involvement, establishment and tracking of milestones, constant oversight, quality control, activity reporting, statistical evaluation, employee status calls & meetings, onsite customer & employee visits and in-depth project reporting, VMSI is able to deliver on our promises and meet our customers’ expectations. Technology is a large part of how VMSI is able to effectively deliver support services anywhere in the United States. We have invested in launching 100% of all VMSI applications and data to cloud-based application and data hosting, accessible by all VMSI employees from any computer, from any location and at any time day or night. Our employees are able to perform the required services with full access to all VMSI resources, applications and data to include: Program Management, Activity Reporting, Security Clearances, Benefits Administration, Time Reporting and Internal Expertise Networking & Resource Sharing. Our CUSTOMER’s will experience VMSI’s culture, one in which customer service is paramount and every employees’ #1 goal is to ensure we are “The Best Decision our Clients make”. 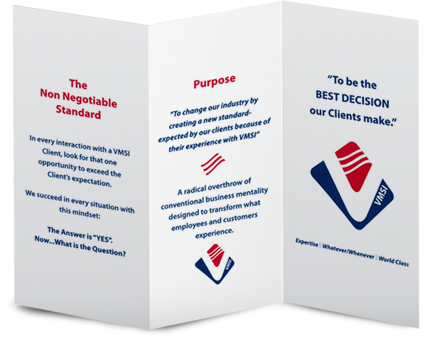 As demonstrated by our corporate credo card which all VMSI employees are required to carry at all times, the expectations of our employees and the standards to which they are held are simply non-negotiable. Our Mission—Our Promise—Our Goal to each customer is: “To be the BEST DECISION you make”.